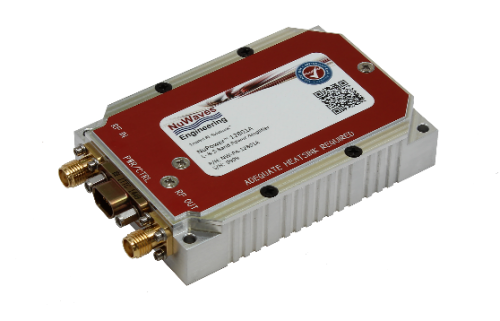 The NuPower™ 12B01A-09 S-Band Power Amplifier is a broadband, high-performance solid-state power amplifier module that delivers at least 10 watts of RF power for CW and near-constant-envelope waveforms in S-band frequencies of 2.0 GHz to 2.5 GHz from a very small package. 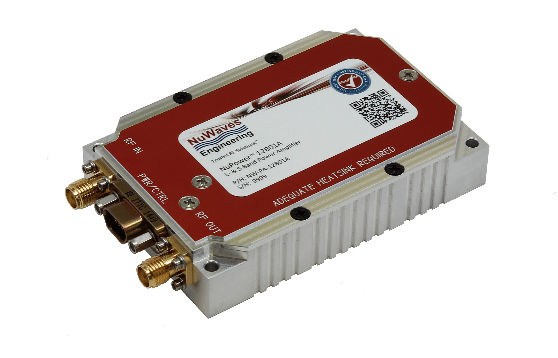 The NuPower module accepts a nominal 0 dBm input drive level from the transmitter/transceiver and provides 40 dB of gain to generate at least 10 watts, and typically 16 watts, across the entire operating band. With a small form factor (3.9 cubic inches) and high efficiency operation (30% to 50%) based on state-of-the-art Gallium Nitride (GaN) power amplifier device technology, the NuPower L- & S-Band PA module is ideal for broadband RF telemetry and military communication systems that require reliability and minimal size, weight, and power consumption (SWaP). All NuPower PAs come standard with a Micro-D connector with 18″ flying leads for interfacing to the unit. Available options for the PA include a +30 dBm / 1 W input drive level version (P/N: NW-PA-12B01A-D30), a fan-cooled heat sink, and an interface cable with banana plug terminations for lab testing.